According to Cartoon Brew, Yoyotoki is a young vixen who “…was raised with cell phones, computers, and all of the other gadgets and trappings of modern life, but her parents soon got tired of the rat race and decided to move to the countryside, where they encountered a tornado and found themselves in a strange land called Mytholopia, a beautiful world filled with waterfall farms, rainbow forests, and desert canyons.” So says Niki Yang, creator of Yoyotoki: Happy Ears!, a new proposed animated TV series. Ms. Yang is known in animation circles for her work on shows like Fanboy and Chum Chum, Family Guy, Gravity Falls, Clarence, and Adventure Time. 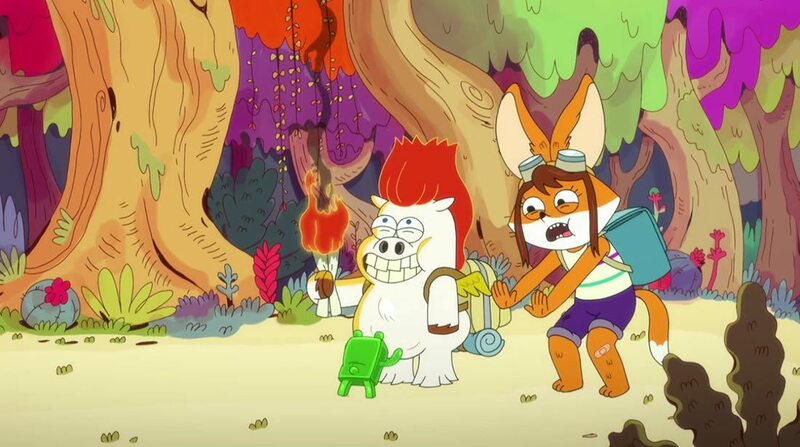 Now she’s brought us the adventures of Yoyotoki (and her friends, “…a fantastically elastic gummy bear named Steak and a sloppy pig named Hotwings…”) as her bid to be the next pilot show that’s picked up for production by Amazon Studios. Check out the Cartoon Brew article to find out more about the show and how to vote for it. You can also check out the pilot itself over at Sidereel and see for yourself.